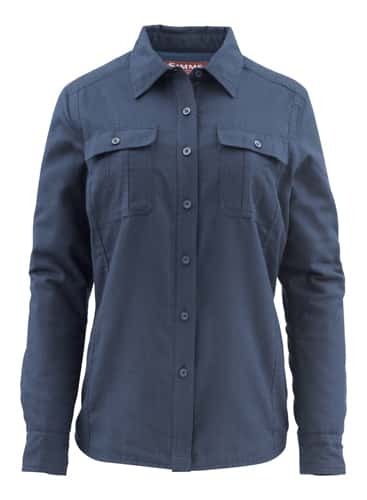 The new Simms Women's Guide Insulated Long Sleeve shirt has a soft 100% polyester flannel outside. The body of the shirt has Dri-Release technology for added warmth and wicking while there is Primaloft Black insulation in the sleeves. The Women's Guide shirt with insulation has two front chest pockets with button closures and a longer tail for extra coverage while bending over to release your catch. The Simms Guide Insulated shirt for women is perfect for fishing on those cooler days when a jacket is too much but you still need a little something to keep you warm. I absolutely love this Women's Simms guide insulated shirt. It is more so a jacket with soft flannel on the outside and smooth (almost like tafetta) on the inside. I typically wear it with a thin Simms layering piece underneath and I stay comfortable all the cold day long. I would like it even better if it had hand pockets!